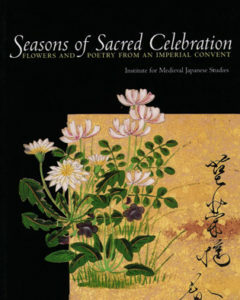 The Institute for Medieval Japanese Studies, founded in 1968, celebrated its thirtieth anniversary with a wide range of activities commemorating the seven-hundredth anniversary of the death, in November 1298, of Abbess Mugai Nyodai, the Zen Abbess whose life and legacy have been the inspiration for much of the work of the Institute during the past decade. Abbess Mugai Nyodai (1223-1298) was a disciple and spiritual heir of the Chinese Rinzai Zen monk Wu-hsueh Tsu-yuan (known in Japan as Mugaku Sogen [Bukko Kokushi]); the founding Abbess of Keiaiji Convent, the head temple-complex of the Five Mountain Rinzai Zen Convent Association; and the spiritual matriarch of many of the remaining imperial convents today. The discovery of the magnificent life-size thirteenth-century chinso portrait sculpture of Abbess Mugai Nyodai was one of the initial revelatory events that drew scholarly attention to the wholly ignored female side of Buddhist institutional history and, more broadly, to the role of women in Japanese religious history. In many ways, therefore, she has been the Institute’s ‘patron saint’. We invite you to celebrate with us our past thirty years and to share in our ongoing goals and aspirations. As we approach the new millenium, we hope you will join us and support our innovative programs so as to bring to the center stage of world culture those extraordinary areas of Japanese culture which remain too often neglected. Commemorating the thirtieth anniversary of its founding in 1968, the Institute held a series of events November 21-23, 1998 on The Culture of Convents in Japanese History at Columbia University. Nuns from the few remaining Imperial Buddhist Convents of Japan now being studied by the Institute visited the United States for the first time to conduct a rare Buddhist ceremony in St. Paul’s Chapel in memory of their spiritual leader, Zen Abbess Mugai Nyodai, who is known as the first female Zen master in Japan. The seven-hundredth anniversary of her death in November 1298 was commemorated as part of the Institute’s thirtieth anniversary. During the memorial service, nuns from Kyoto, Osaka, Nara and Tokyo conducted Buddhist rituals never before seen outside Japan, and never viewed by the general public even in Japan. Chief Abbot Keido Fukushima of Tofukuji monastery performed a special incense burning and poetic invocation. 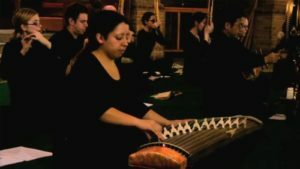 Unprecedented musical offerings were conducted in honor of Abbess Mugai Nyodai, including not only a world premier of Mind in Mirror: Nyodai’s Dream composed by Yuriko Hase Kojima for shakuhachi, pipa and bass koto, but also an offering of songs composed by the medieval German Catholic nun, Hildegard von Bingen, performed by members of Columbia’s Collegium Musicum. 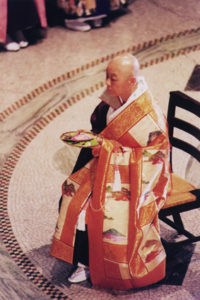 The entire ceremony took place in front of a Buddhist altar arranged before an exact replica of the thirteenth-century chinso portrait statue of Abbess Mugai Nyodai. The replica, the original of which is designated an Important Cultural Treasure and enshrined in a Kyoto convent, was lent to the memorial service by its owner, the Kanagawa Prefectural Kanazawa Bunko Museum. 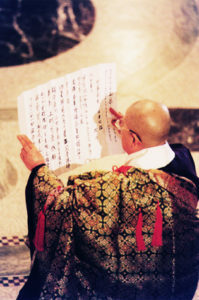 Led by Abbess Shozui Rokujo of Domyoji Convent, the nuns’ rituals included a rare performance of the scattering of paper lotus petals in a circumambulation to gagaku music. At the conclusion of the two-hour service, more than 200 guests from around the world offered incense at the altar in honor of Abbess Mugai. 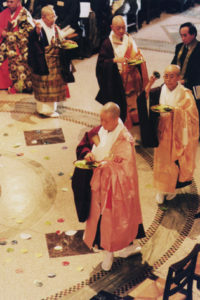 Following the memorial service, the Buddhist clergy and special memorial service guests participated in a traditional tea ceremony provided by the Urasenke Chanoyu Center of New York in the Rotunda Gallery of Low Memorial Library. Beginning that afternoon, scholars, students and Buddhist nuns and monks gathered for three days in Kellogg Conference Center at the international symposium, The Culture of Convents in Japanese History, which was the central academic core of the commemoration. 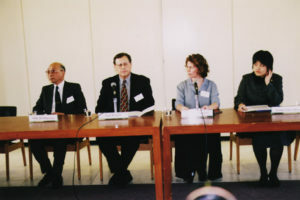 A direct outgrowth of the Institute’s ongoing Imperial Buddhist Convent Survey Project, the international symposium enabled the Institute’s team of scholars to report to a broader audience on heretofore unexamined materials that have been emerging in the survey since its inception in 1993, some of which date back to the thirteenth century. The symposium provided an unprecedented forum in which scholars from Japan, Australia, Europe, Canada and the United States who are interested in Buddhism and the role of women in Japanese religious history were able to share and discuss their research methods and results. Members of the Institute’s Imperial Buddhist Convent Survey Project shared with the public their first-hand experience archiving the historical documents, diaries and artwork in several Imperial Buddhist Convents. At the same time, while meeting with the scholars in New York, the Buddhist clergy informally offered insight into their unique convent lifestyle. One aim of the Convent Survey Project will be to publish portions of the archives as primary sources on the rituals and beliefs of religious women. New strategies for research and ideas for curriculum development were set forth, and the importance of integrating into academic courses throughout the world the study of female religious traditions in Japan was made clear. The delicate link between researchers and convent-residing nuns was strengthened through direct contact, and young scholars and established researchers alike were encouraged to focus their curriculum, funding, publications and discourses on this wholly ignored female side of Buddhist institutional history. Prof. Maribeth Graybill (Swarthmore College), Prof. Shunsho Manabe (Kanagawa Prefectural Kanazawa Bunko Museum) and Dr. Sadako Ohki (Yale University Art Gallery) were the exhibitions curators, while the Institute provided the requisite financial and institutional support. Guests also visited Images of the Dharma: Buddhist Art from Columbia University Collections (November 13, 1998 – January 31, 1999). This exhibition, created by Dr. David Sensabaugh of Yale University Art Gallery, presented a selection of Buddhist sculptures from various Asian traditions donated to Columbia University by J.G. Phelps Stokes and Arthur M. Sackler. Throughout the three-day program, guests had the opportunity to visit two art exhibitions held in support of the symposium. Days of Discipline and Grace: Treasures from the Imperial Buddhist Convents of Kyoto (November 6 – December 4, 1998) presented the culture of Imperial Buddhist Convents to the public for the first time in history. Calligraphy, ritual objects and portraits of abbesses — many of which had never before been exhibited — were on view. Also displayed were furnishings related to the daily lives of Japanese Buddhist nuns, including books, games and utensils created over the centuries by the nuns themselves. 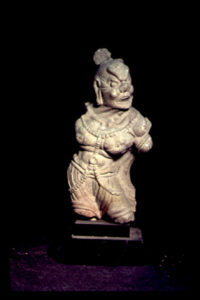 The thirteenth-century portrait statue of Abbess Mugai, when not serving as the focal point of the memorial service, was also on display in the exhibition. We hope that our guests enjoyed and garnered knowledge and useful connections from the exhibitions, symposium, memorial service and the Thirtieth Anniversary Celebratory Reception where guests, including the nuns, enjoyed fine Japanese cuisine prepared by the Nippon Club. Positive reviews and articles on the thirtieth anniversary commemorative events attest to their success. The New York Times, the Yomiuri Shinbun and Chonaiho (the newsletter of the Imperial Palace Household Agency, kunaicho), featured articles on various aspects of the project. Toun Kanazawa of Daishoji Imperial Convent participates in the sange ritual. Letters received following these events indicate the important impact made both on scholars and on the convents we are studying. Professors have written to say they have altered their courses and curricula as a result of the symposium. And some abbesses heretofore reluctant to allow scholars into their archives have now requested that the Institute send scholars to them to help them study their own treasures. Much of the Institute’s success in November 1998 can be attributed to the individuals and institutions which have supported our projects for many years or which provided assistance directly related to the thirtieth anniversary commemorative programs. The Institute would like to extend its most sincere appreciation to: the Imperial Buddhist Convents of Japan; the Tides Foundation; the Japan Foundation; Shinji Shumeikai; the Kanagawa Prefectural Kanazawa Bunko Museum and Director Shunsho Manabe; C.V. Starr East Asian Library and Director Amy Heinrich; the Consulate General of Japan, New York and Ambassador Seiichiro Otsuka; TV Man Union, Inc. and President Yutaka Shigenobu; Mainichi Broadcasting, Inc.; The Agency of Cultural Affairs, Government of Japan; Japanese Chamber of Commerce and Industry of New York, Inc.; The Nippon Club; New York Buddhist Church and Resident Minister T. Kenjitsu Nakagaki; Urasenke Chanoyu Center of New York and Director Hisashi Yamada, Mr. Yoshihiro Terazono and staff; Mitsubishi Aluminum Company, Ltd.; Columbia University’s Office of Art Properties and Director Sarah Weiner; Dr. David Sensabaugh; Noriko Fuku and Associates; Toraya, New York; Collegium Musicum; the staff of St. Paul’s Chapel and the Kellogg Conference Center; and the many volunteers who assisted us before and during the events. We offer our profound appreciation also to Jayne Kim, 1997-98 Intern in Buddhism-related Projects & Symposia and to Lori Meeks, 1997-98Intern in Pre-modern Japanese Art & Culture, both of whom added great value to the November events. Lori, a former Columbia University undergraduate student, began Princeton University’s graduate degree program in the Department of Religion in September 1998 and presented a paper at our international symposium. Jayne is a graduate student in the Department of Religion at Columbia University and continues to work part-time at the Institute. Without the hard work and dedication of Lori, Jayne and our other Interns and staff members, the Institute’s projects could not have come to fruition so efficiently and scrupulously. During New Year’s week of the year 2000, the Mainichi television network in Japan broadcast a ninety-minute documentary on the daily life and rituals throughout one year at several of the Imperial Buddhist Convents to which we have gained access. The documentary is being prepared by TV Man Union, Inc. with the advice of Prof. Barbara Ruch and survey team members, and will begin with scenes from our New York memorial service. This will be the first time the Japanese people themselves will learn about life in Imperial Buddhist Convents. Whether or not you were able to join us this past November, we hope you will look for this broadcast. 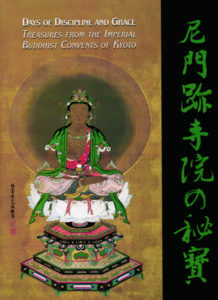 For the past decade, the Institute’s work has focused on opening what has been one of the most astonishingly neglected areas of research in Japanese religious and cultural history: the vital role played by religious women and nuns in the introduction and spread of Buddhism in Japan, as institution builders and patrons, and in the founding of major networks of convents to which present-day Imperial Buddhist Convents trace their roots. 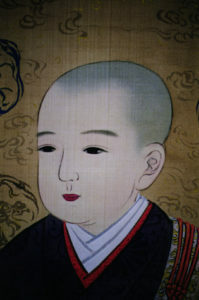 To date, the history of Japanese Buddhism has been based exclusively on the writings of Japanese monks and on the study of the archives of male monastic institutions. The entire other half of religious history — that of ecclesiastical women — has been our challenge. 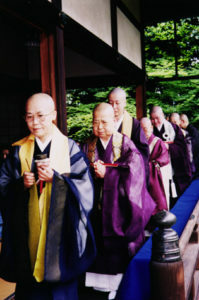 Prof. Barbara Ruch’s initial research concerning Abbess Mugai Nyodai provided the impetus for the imperial convents in Kyoto to open their theretofore tightly closed doors to one or two of the Institute’s Research Associates in 1993. This initial link with the convents marked the inauguration of our Imperial Convent Survey Project which continues today and will be ongoing for many years. About a dozen imperial convents, or ama monzeki jiin, of various sects are still in operation today. Several still extant were initially founded by Abbess Mugai Nyodai, and others consider her their spiritual founder. They remain one of Japan’s greatest cultural treasures, and yet they are barely known by scholars, to say nothing of the general public. Imperial Convents are those convents where, over the centuries until the 1870s, Japanese imperial women took the tonsure and resided as abbesses and nuns. While being places of spiritual discipline and worship, they were, equally, small aristocratic courts where the language of imperial circles was maintained and the cultural pleasures of poetry, calligraphy and other traditional occupations of court women continued to be practiced. Entering a convent meant abandoning secular domestic married life, but it did not mean abandoning the cultural achievements that these noblewomen had attained. They brought with them to the convent, as if a dowry to a marriage, all manner of furnishings, libraries of books, secular and sacred scrolls, paintings, screens, lacquerware, utensils for the spiritual disciplines of tea and flower arrangement and multitudinous other works of art. Once a woman took the tonsure, her magnificent secular robes remained treasures of the convent. If she had entered as a child, her exquisite toys and dolls, likewise, were treated with great care and preserved. Over the centuries, the daily life of each imperial convent was recorded on paper. Its accounts, records of the purchase and sale of land, the letters and diaries of abbesses, and directives from the Imperial Court were carefully retained in its storerooms. In short, these convents are today like small, locked jewel boxes filled with pearls and precious stones of historic data, somehow forgotten, waiting to be rediscovered. Due to the ravages of time and to the enforced separation of the Imperial house from Buddhism during the Meiji Restoration in the late nineteenth century, very few Imperial Convents remain today. The women now who have decided to become nuns and devote themselves to life careers in the Imperial Convents that have survived are vital spiritual and cultural guardians of one of the most extraordinary of institutions in Japanese history. Despite the cultural, economic and political prominence Japan has assumed in the world during the past century, few Western academic institutions have incorporated into their study of Japan courses on its indigenous religion, Shinto, which is ubiquitous in Japanese life activities. In response to such neglect, the Institute held at Columbia University in March 1998 an international workshop, Shinto Studies in the West: Toward a Reexamination of University Curricula and Future Research Directions, where scholars from Tokyo, Kanagawa, Copenhagen, Vienna, Wales and the United States convened to create a Shinto network and discuss strategies for the future development of Shinto studies. The impetus for the Shinto workshop was a growing awareness that the study of Japanese religions in Western universities and research centers has become overwhelmingly dominated by a focus on Buddhism, especially sectarian, doctrinal Buddhism. Academic courses on the history of Japanese religions offer almost no material on the complex religious faith in both Buddhist deities and kami that has permeated the lives of Japanese people for many centuries. We extend our sincere gratitude to the International Shinto Foundation (Kokusai Shinto Gakkai) and the Tides Foundation, both of which made the 1998 Shinto workshop possible. Organization of the workshop was greatly aided by the work of our 1997-98 Intern on Shinto Workshops & Lectures, Tomoko Sugahara, a graduate student in the Department of Philosophy. In recognition of the Institute’s attempt to bring Shinto closer to the forefront of Japanese religious studies, we received in January 1998 a gift of the 120-volume set of the Shinto Taikei (published 1977-96), generously donated by the International Shinto Foundation. The set was placed in the care of Columbia University’s C.V. Starr East Asian Library, just in time for the visiting workshop scholars to peruse it during their stay in New York City. One Columbia University graduate student who is already making use of the Shinto Taikei is Iori Joko. Iori is currently writing her doctoral dissertation, “Sendai kuji hongi and the Japanese Mythological Tradition”, which translates and analyzes one of the earliest texts in the Shinto canon. She is also a Research Associate of the Institute and is the recipient of our Shinto Fellowship made possible with the support of the International Shinto Foundation. Music has been an integral part of secular and religious life in every era of Japanese history. 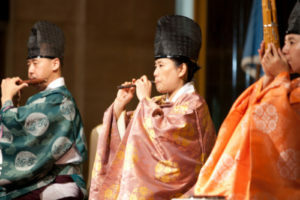 Appreciation of Japanese instrumental and vocal performing arts in the West has evolved greatly in the past century. 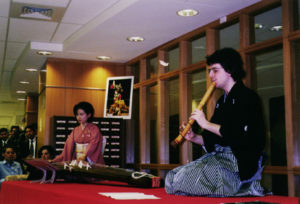 To help strengthen such musical appreciation and facilitate greater incorporation of Japanese instruments and musical traditions into the Western musical world, the Institute has endeavored to create a network of instrumentalists and composers and has sponsored several innovative programs over the past two years. 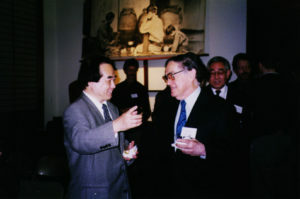 The Institute provided extra financial and institutional support to the International Chikamatsu Symposium which was organized and funded by the Donald Keene Center of Japanese Culture in October 1997. Remarkable performers, scholars and theater specialists joined the three-day symposium to discuss the life of and perform the samisen and vocal (hayashi) musical narration for certain Kabuki and Bunraku plays written by Chikamatsu, the great seventeenth-century playwright. 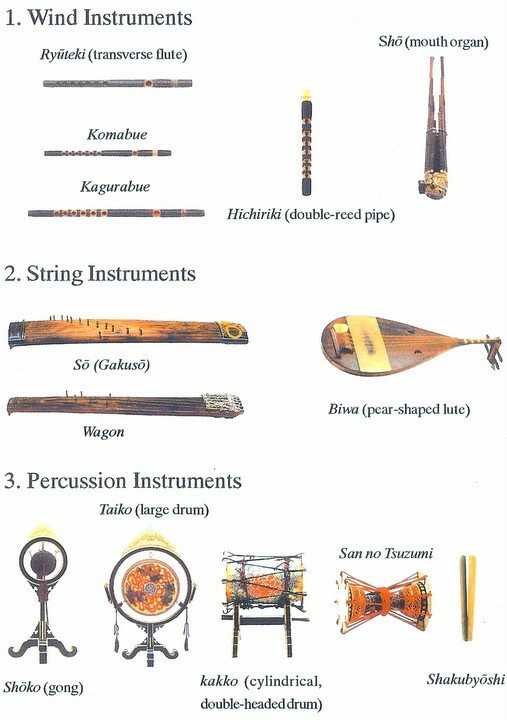 Late in 1997 we received from the estate of the late Leonard C. Holvik, Professor of Music at Earlham College, his collection of musical instruments, scores, records, audio and video tapes, as well as books and papers related to traditional Japanese music. The Holvik Collection was carefully cataloged and then divided among our Institute, the Center of Ethnomusicology, C.V. Starr East Asian Library and the Gabe M. Wiener Music & Arts Library, each of which is using the materials both to develop a stronger curriculum in Japanese music, as well as to provide expanded compositional and performance opportunities for students at Columbia University. 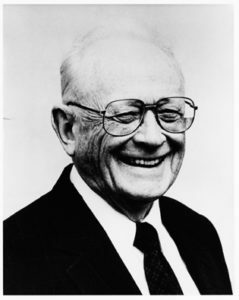 In appreciation of his gift to us, the Institute held A Celebration of the Life & Music of Leonard C. Holvik on February 27, 1998. At a commemorative ceremony in St. Paul’s Chapel, Prof. Holvik’s wife Cecile Holvik and daughter Claire Favro offered reminiscences, and Prof. Donald Keene, Prof. Barbara Ruch and other members of the Columbia University East Asian and Music faculty offered words of gratitude, as did Deputy Consul General of New York, Mr. Masuo Nishibayashi. Cynthia Nyoen Chaffee performed Futaiken san’ya, a Zen meditative shakuhachi solo piece, Masayo Ishigure performed Tadao Sawai’s koto solo, Tori no yo ni, and in celebration of Prof. Holvik’s long career also as a choral director, members of Columbia University’s Collegium Musicum sang Pange lingua gloriosi. Following the ceremony, guests enjoyed musical demonstrations of the koto and shakuhachi, videos of modern Noh plays, the music of which had been composed by Prof. Holvik, and an exhibition of the Holvik Collection in the Gabe M. Wiener Music & Arts Library. 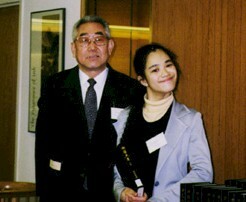 We established in 1997 our first Internship in Traditional Japanese Music which was held by Megumi Shibata, an undergraduate student at Columbia. 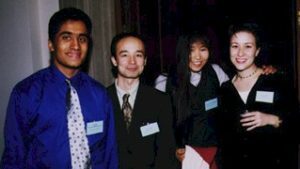 We offer our appreciation not only to Megumi but also to Roberta Strippoli, a former Columbia University graduate student who served as the Institute’s Staff Associate in 1997-98 and is now studying at Stanford University, for their kind assistance with our Japanese traditional music projects. 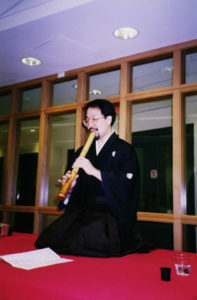 More recently, in March 1999 the Institute co-sponsored with Music From Japan and the Donald Keene Center of Japanese Culture a one-day shakuhachi workshop at Columbia University in which eminent shakuhachi soloist Teruhisa Fukuda conducted with composer Atsuki Sumi a master class on both traditional and contemporary pieces. We continue to seek new ways to incorporate Japanese music into the Columbia University curriculum and the greater community of New York City. The Institute hopes to create a stronger network among local instrumentalists, dancers, composers, faculty, students and other individuals interested in Japanese music. If you would like to join our network or help us strengthen in some way the appreciation and performance of Japanese music, please contact us. We cordially invite scholars and students to visit our Institute and study materials in our archives and collections. The Institute offers two or three travel grants per year of up to $1500 to a limited number of students or scholars of any nationality who are engaged in research that would benefit from the use of our microfilm, photograph and slide archives of medieval and early modern manuscripts in the following two categories: (i) Nara ehon and emaki from the British Library, British Museum, Chester Beatty Library of Dublin, New York Public Library Spencer Collection and other privately held works; and (ii) hand-calligraphed komonjo diaries and other manuscripts dating from the thirteenth through the eighteenth century from Daishoji and Hokyoji, Kyoto Imperial Convents which are in the Rinzai Zen tradition of Abbess Mugai Nyodai. The size of individual grants is dependent upon the cost of economy travel to New York City and the number of days of temporary accommodation required. 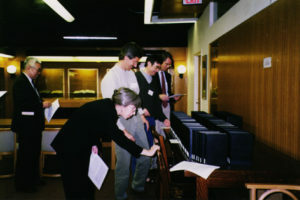 The archives are generally open year-round. There is no application deadline, but no more than two or three scholars can be funded in any given fiscal year so early application is recommended. The Institute for Medieval Japanese Studies, founded in 1968 by Prof. Barbara Ruch at the University of Pennsylvania and since 1984 located at Columbia University, is a research and liaison center designed primarily to serve European and American scholars whose main area of study focuses on medieval Japan. The overall purpose of the Institute is to encourage both individual and collaborative research on all aspects of Japanese civilization relative to the medieval period (primarily but not exclusively the Kamakura and Muromachi periods, 1185-1600), centuries which, until the 1970s, had been relatively neglected among Japanese and Western scholars alike. The facilities of the Institute are available to all scholars and students of medieval Japan from any academic institution. 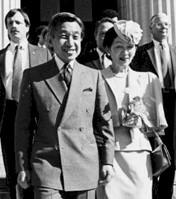 The initial work of the Institute in the late 1960s and early 1970s, supported by the Joint Committee of the Social Science Research Council and American Council of Learned Societies, focused on the convening of several Task Forces of Humanities throughout a two-year period for the purpose of reexamining the state of Western scholarship in medieval Japanese cultural fields and the effect that weaknesses in this area have on our understanding of the pre-modern Japanese world. At the same time, with the support of the American Philosophical Society, a first-hand survey of Japanese medieval hand-painted books and scrolls (Nara ehon) in European and American collections was undertaken in order to locate important works now lost in Japan and extant only abroad. As a result of the rich discoveries made, Prof. Ruch organized a large scale research project in London, Dublin and New York in August, 1978, concluding in Tokyo and Kyoto in August 1979. This International Workshop-Conference on Illuminated Medieval Japanese Literary Texts: Toward the Development of the Nara ehon Field was carried out by thirty major scholars from Japan, Europe and the United States representing the disciplines of literature, art history, religion and folklore, and was designed to analyze, photograph and catalog medieval Japanese Nara ehon abroad and establish the legitimacy of a new field of study. 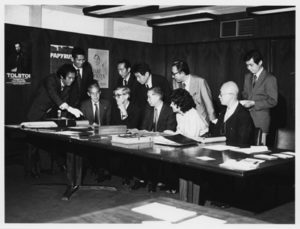 The first exhibition of Nara ehon ever held outside Japan was presented at the Japan Society in September 1978, and this workshop-conference produced two books, four catalogs and an educational slide set and established the Institute’s archive of microfilm and photographs. 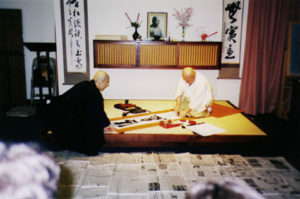 The 1980s were devoted to opening research on the religio-secular performing art known as etoki (painting recitation), which in the 1970s was not a recognized field of study outside Japan. 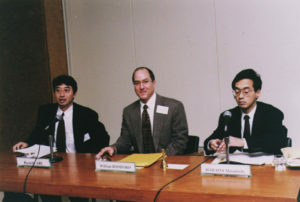 In addition to Association for Asian Studies panels, the Institute organized in 1982 an inter-university conference on the phenomenon of etoki in various Asian traditions: Japan, China, Indonesia, Iran and medieval Europe. Various publications resulted, and etoki now has its own academic journal in Japan. In 1989 the Institute initiated efforts to add the study of women in Buddhism to what had theretofore been a discipline of Japanese religious history focused exclusively on the study of monks and their writings and practices. The Workshop-Conference on Women and Buddhism in Pre-modern Japan was held in New York attended by seven Japanese scholars and close to forty Western participants. 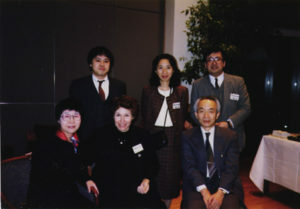 Over a period of three years Association for Asian Studies panels were organized to stimulate the field. In 1993, with the joint sponsorship of the National Institute of Japanese Literature in Tokyo, the Institute initiated the Imperial Buddhist Convent Survey Project discussed elsewhere in this issue. This long-term survey of the heretofore unstudied archives of Japan’s ama monzeki jiin is examining, microfilming and creating research archives of formerly inaccessible documents held by Imperial Convents, as well as conducting oral interviews with the abbesses and nuns. The Imperial Buddhist Convent Survey Project is now the focal point of our fundraising and research programs in Japan and the United States. who for many years supported the work of the Institute as Research Associates on one or more of its major international projects and who continued to give valuable counsel as Senior Consultants. Seasons of Sacred Celebration: Flowers and Poetry from an Imperial Convent shares with the public for the first time eighteen unusual paintings preserved for centuries at Daishoji, the highest ranking Imperial Buddhist Convent in Japan. The shikishi and tanzaku poetry cards include beautiful calligraphic renderings of classical poems from such well known anthologies as the Kokin waka shu, the Shin kokin waka shu and the Shui waka shu, as well as delicate floral illustrations linking each poem to the appropriate season. The anonymous paintings, probably dating from the late seventeenth century, are unique in format in that the flowers and vines actually extend beyond the edges of the cards. They are the only known sets of this kind extant in Japan. The cards offer eloquent testimony to the survival of the aristocratic arts in Edo-period Japan. 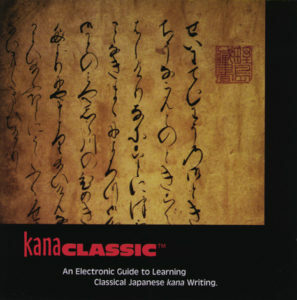 kanaClassic: An Electronic Guide to Learning Classical Japanese kana Writing is a path-breaking CD-ROM developed by Prof. X. Jie Yang (University of Calgary) with the assistance of Dr. Sadako Ohki (Yale University Art Gallery) and Prof. Sonja Arntzen (University of Alberta) and sponsored by the Japan Foundation and the Institute for Medieval Japanese Studies. Classical handwritten kana writing, widely used in Japan from the tenth through the nineteenth century, is the ancestor of modern hiragana, a complex syllabic writing system that evolved from cursively writing Chinese characters. This new approach to learning how to read handwritten classical and medieval documents in kana is suitable for self-study as well as classroom use. The CD-ROM displays in full motion the writing process for kana characters; presents interactive reading practice with medieval and pre-modern masterpieces; and offers the capability to produce the user’s own kana work by using a standard keyboard and mouse. System Requirments: English or Japanese version of Windows 3.1 (with AVI driver) or Win95/NT, VGA, or SVGA, or SoftWindows for Macintosh 5.0, with 256-color or higher graphic card, CD-ROM drive, sound card, and mouse. We are overwhelmingly grateful to Her Majesty Empress Michiko who recently has pledged to donate on an annual basis a portion of her publication royalties to the Institute’s Imperial Buddhist Convent Survey Project. 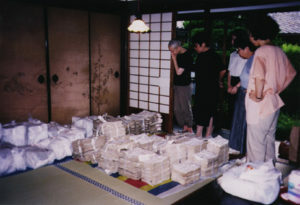 Empress Michiko’s generous gift will support the cataloging, microfilming, photography and printing of valuable convent materials, the repair and conservation of such archives, as well as tape-recorded oral interviews with the current abbesses and nuns. We are indebted to her for helping to preserve one of the most extraordinary living cultural institutions of Japan. The Institute for Medieval Japanese Studies is happy to announce that on April 29, 1999 our Director, Prof. Barbara Ruch, was named recipient of one of Japan’s highest Imperial decorations, the Kunsanto Hokansho (The Order of the Precious Crown, Butterfly) for her work as an institution builder, a pioneer of multiple new fields of Japanese learning, and an initiator of international scholarly and public outreach projects which have deepened understanding of Japanese culture in the United States, Europe and Japan itself. The decoration will be conferred by Ambassador Seiichiro Otsuka of the Consulate General of Japan in New York, in a ceremony in New York City later this year. The Order of Culture (Bunka kunsho) for contributions to arts, letters and culture. On this unprecedented occasion we share with you our joy and extend our deepest gratitude to all of you who have been long-time friends and supporters and who have helped to make the Institute’s projects successful. We hope that this recognition of Prof. Ruch’s work will bring to the Institute’s programs even wider participation of scholars and the general public and that you will continue to offer us your support and encouragement. If there are specific ways in which you would like to join us in our work through collaboration or sponsorship, please let us know. Please be sure to update your databases with our new mailing address and new fax number. Congratulations to Prof. Barbara Ruch who will retire from her teaching post as of July 1999 to become Professor Emerita at Columbia University. Prof. Ruch will continue serving as the Institute’s Director and leading the Imperial Buddhist Convent Research Project. After two years with the Institute, Tammy Allen has been promoted to Executive Director. She will simultaneously pursue a graduate degree in the School of International and Public Affairs at Columbia University. With equal parts sadness and joy we announce the resignation from the Institute of Dr. Sadako Ohki and her appointment to the post of Assistant Curator of Asian Art at Yale University Art Gallery. 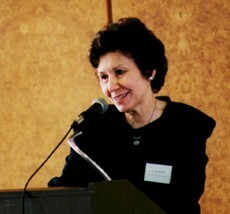 Dr. Ohki, formerly the Institute’s Associate Director of Research, began her work at Yale in January 1999. We extend our warmest congratulations to Dr. Ohki and are happy she will continue as a Research Associate of the Institute and participate in our ongoing convent survey projects. We extend our sincere gratitude to both Program Associate Ken Aoki, a graduate student from Japan studying U.S. History, and Program Assistant Axel Karpenstein, a graduate student from Germany studying Political Science and Japan, for their fantastic work over the past year. Thanks to the ongoing assistance of Ken and Axel, our programs continue to flourish. As we approach the twenty-first century, our goals remain to increase in exponential dimensions the research being conducted on convents; to contribute to the increase in publications on the role of abbesses and nuns in all disciplines; to effectively integrate into the current academic curriculum a full measure of primary sources and historical materials that document the beliefs and practices of religious women; and to strengthen the delicate but vital threads that now link scholars and the objects of their study: i.e., the university researcher to the convent-residing nun and her preserve. Toward these ends, we will continue to conduct the amadera monzeki chosa and microfilm and catalog the archives of other important religious institutions which can provide insight into the history of religious women in Japan. Due to concerns for the preservation of the photographs and microfilm resulting from the Survey Project, plans are being made for the construction of a small research archive facility in Kyoto devoted to Imperial Buddhist Convent materials. The publication of the forthcoming multi-author Engendering Faith: Women and Buddhism in Pre-Modern Japan has been a major undertaking by numerous people, and we hope to see it finished soon. We look forward to future cooperation with Columbia University’s new Chiang Ching-kuo Foundation for Cultural and Institutional History as we expand our research on female religious traditions to include the long and influential institution of Buddhist nuns in the Chinese tradition. And we look forward with pleasure to jointly sponsoring outreach programs with the Donald Keene Center of Japanese Culture. In line with our goal to expand Western university curricula to include studies of Shinto, we will soon inaugurate an annual Distinguished Lecture on Shinto. 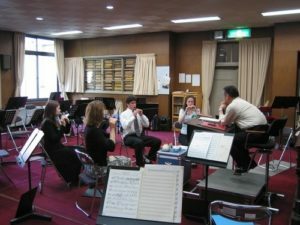 We also hope to break new ground in the relatively neglected area of Japanese traditional music, not only to stimulate its inclusion more broadly in ethnomusicology and East Asian literary arts courses, but also to provide modern music majors with instrumental and compositional alternatives and opportunities to enrich the modern world of music. KechiEn is a Japanese word that means to create a bond or link to something sacred. 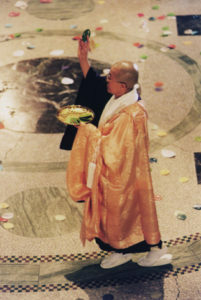 Throughout the centuries, lay men and women as well as monks and nuns have created links between themselves and the serene inner beauty of Buddhas and Bodhisattvas by offering something of themselves (money, food, flowers, their time) for a service, and thereby gained merit for their future good karma. The Institute’s activities are entirely dependent upon external funding through donations, grants and gifts. We need your financial support. Please form a KechiEn link with us by considering the Institute when you are making your financial donations or planning your estate. You can also help us in the short term by donating art or property, the sale of which will provide needed support for the extremely costly task of preserving and photographing religious and cultural treasures that belong to the world for posterity.